Many excellent headline features for photographers appeared in macOS Mojave, but a small one that's truly helpful is the debut of filenames with our thumbnails. They're helpful in many ways, including knowing which camera the image was captured with when shooting RAW. Both original filenames and edited titles are displayed here in Photos. Read on to learn how to control this. Alternatively, you can have a title appear with your thumbnail instead of a filename. (This used to be your only choice.) Either approach is controlled by the "Add a Title" field in the Info box (Window > Info). Just make sure that you have titles turned on so that either of these bits of information shows up (View > Metadata > Titles). If the Add a Title field is left blank, then Photos will display the filename when viewing thumbnails. On the other hand, if you do add a title, then that is displayed instead. You can see examples of both in the illustration above. And for those situations where I want the filename to appear, but I do want some additional information in the metadata, I enter that in the Add a Description field, which has no effect on the metadata displayed with the thumbnail. Like I said, this isn't a headline feature. But for those of us who use Photos regularly, we really appreciate (finally) having filenames appear with our images. This is The Digital Story Podcast #657, Oct. 16, 2018. Today's theme is, "Gearing Up for PhotoPlus Expo." I'm Derrick Story. Much in the way that Photokina was an important European event for the photography community, I think PhotoPlus Expo will carry more weight than usual in the U.S. How will the manufacturers follow up all of those September announcements? On today's podcast, I discuss what I anticipate in New York, and how I'm preparing for it. I hope you enjoy the show. The show floor opens on Oct. 25 in Javits Convention Center, NYC. Most of the heavy hitters are there, ready for their U.S. encore performance. I will be there as well, reporting first, then working in the Skylum booth on Friday and Saturday. As I prepared for my show reporting, I started with the Expo Hall booth layout. I think a lot can be deciphered from the floor plan. For example, Canon, Nikon, and Sony have the largest booths, with Fujifilm right on their heels. The investment by Canon and Nikon make perfect sense, since they both have new full frame mirrorless cameras to show off. Sony, being the leader in this category, needs to be on the offensive as well to protect their position. But Fujifilm's very large booth shows their confidence in the X-T3 26 MP APS-C mirrorless offering - as well they should. 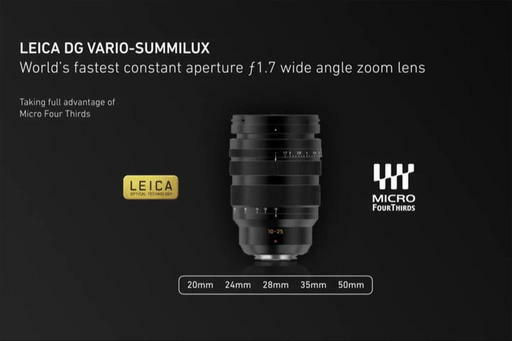 They have a more extensive library of native mirrorless lenses than either Canon or Nikon, and a proven track record for the X-T series of cameras. At the next level, we have Olympus, Epson, Tamron, and Sigma. Tamron and Sigma have been very active lately, including Sigma joining the Leica/Panasonic partnership for full frame mirrorless. Epson needs a lot of space to display its output and printers. But for me, Olympus is the interesting member of the second tier. They don't have any new announcements, so they may be positioning Micro Four Thirds as the smart alternative for travel photographers. In the third tier, we have Ricoh/Pentax, Skylum, Think Tank Photo, Zeiss Camera Lenses, and Panasonic North America. I didn't see Lowepro or Tamrac on the list, so Think Tank so have the bag sector sewed up. Ricoh may show off a prototype of the GR III, but doesn't have much else in the works at the moment. Skylum is preparing to release their long-awaited digital asset manager, so their footprint makes perfect sense. What seems odd to me here is the tiny Panasonic booth. They made one of the biggest headline announcements at Photokina. It seems odd to not follow that up with the big guns in New York. As for my preparation, I'm going with the Olympus PEN-F with one zoom and 3 primes. I'm also keeping the Fujifilm XF10 in my pocket at all times, whether I'm at work or not. I'll have my audio recorder with me, just in case I'm able to snag an interview or two. 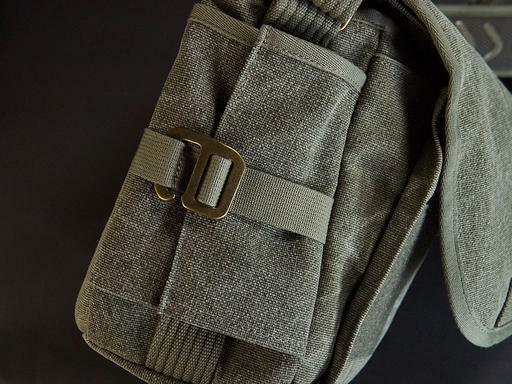 Everything is already packed in my Think Tank Retrospective 7 II shoulder bag. I'll be sure to get plenty of pictures and as many tidbits as possible during my visit to New York. If you plan on attending, be sure to come by and say hello on Friday or Saturday while I'm working in the Skylum booth. I was sitting in a client meeting today, and one of the dominate topics was how we could get ahead of these projects, and stay more organized along the way. As we were talking about this, I was thinking about HoneyBook.com and how this service is designed to do exactly that. From scheduling with its integrated calendar (that also syncs with Google Calendar), to staying on track with its task list and project management tools. And when it's time to invoice, all the bookkeeping is integrated as well. If you're grappling with these same sort of challenges in your freelance or startup business, I encourage you to explore HoneyBook.com. It won't cost you a thing to learn what it can do for you. But it can save you hundreds, if not thousands of dollars up the road. "Honeybook is a purpose-built business management platform for creative small businesses. They help photographers, designers, event professionals, and other solopreneurs save hundreds, if not thousands of hours a year by adding time-saving automation into their business. Honeybook makes it easy to streamline the client process, so you never miss a thing!" And that's why, for a limited time, TDS listeners can get 50 percent off the first year of HoneyBook.com with promo code THEDIGITALSTORY. Honeybook membership includes unlimited access to ALL features, at one low monthly price. So go to HONEYBOOK.COM today, and use promo code THEDIGITALSTORY to get started. Again, that's HoneyBook.com, promo code THEDIGITALSTORY. Earlier this year, Adobe Chief Product Officer, Scott Belsky, acknowledged Adobe was working on a full version of Adobe Photoshop for iPad. Today, we were given a glimpse into the fruits of its labor, with Adobe previewing Photoshop CC on iPad on stage at Adobe MAX 2018 in Los Angeles. To achieve this, Adobe had to create an updated version of its PSD file format it calls Cloud PSDs. In Adobe's own words, "when we ship Photoshop on the iPad, [Cloud PSDs] will also run and automatically show up on your desktop...Suddenly, you'll have this cloud-powered roundtrip experience akin to a Google Docs experience, where literally the source of truth of your Photoshop creation is in the cloud." Gone are the days of having to figure out how to export files in a compatible format and send them to various devices. Adobe Photoshop CC on iPad won't arrive until 2019. In the meantime, you can sign up for a chance to be included on the beta version on Adobe's website. This test includes the iPhone XS Max, the Samsung Galaxy Note 9, Google's Pixel 3 XL (which just got rave reviews), and Sony's Xperia XZ3. It's worth noting here that Apple's iPhone XS Max actually has the smallest battery out of the bunch (iPhone XS Max: 3174mAh; Galaxy Note 9: 4000mAh; Pixel 3 XL: 3430mAh; Xperia XZ3: 3300mAh), and that screen resolutions between phones should be the same for a proper test. That's the case here with Mrwhosetheboss, which made sure to set the Galaxy Note 9's display to the resolution of 2960×1440, rather than the 1080p HD resolution it can be set at. With the resolutions set and the phone's fully charged, Mrwhosetheboss went to work on the test. The iPhone XS Max came in at just over six hours, while the Galaxy Note 9 fell about 12 minutes shorter. In third place? Google's Pixel 3 XL, which lasted about five hours. And the Xperia XZ3 finished out the bottom, finishing up under four hours before dying. Mirrorless cameras have brought a lot of innovation to our craft. One of the areas that I often remind photographers about is in-camera effects. They are often overlooked because they exist outside our normal shooting routines. But they can be quite helpful. On Olympus cameras, for example, we have Art Filters that range from dramatic landscapes to soft focus portraits. You can preview the effects on the camera's LCD or in the electronic viewfinder. Fujifilm cameras have their Advanced Filters as well as film simulations. Other brands have their own proprietary take on this as well. When I'm leading workshops, I encourage participants to try one or two of these to expand knowledge of their own cameras, while at the same time adding more creativity to their images. I also cover this topic in my lynda.com/LinkedIn Learning title, Portrait Photography: High School Seniors. Here's a short movie that covers exactly what I'm talking about. A few things to keep in mind include shooting in RAW+Jpeg so that the effect is applied to the Jpeg, yet you still have your RAW as an untouched safety net. And since you are now relying on those Jpegs, be sure their quality is set to maximum (Fine or Super Fine). And when you bring in those images to your photo management software, I recommend keeping the Jpegs and RAWs separate. I usually put the whole shoot in a project with albums for the different types of images inside. You might be surprised at what you can create with in-camera effects. Sometimes it's a home run, other times it's a strikeout. But either way, I think it will energize your photography. This is The Digital Story Podcast #656, Oct. 9, 2018. Today's theme is "5 Cool Imaging Tricks with macOS Mojave." I'm Derrick Story. macOS Mojave, otherwise known as version 10.14, features a handful of goodies for imaging buffs. 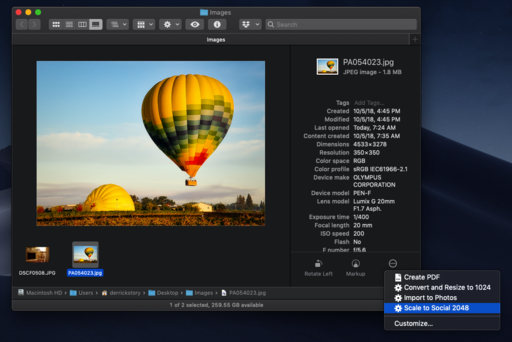 Starting with dark mode, that just makes all of our pictures look better, to improved performance under the hood, this latest operating system for Macs is a pretty sweet ride. But there are a few more goodies that aren't immediately apparent to the eye, but are delightful just the same. And that's the top story in today's TDS Photography Podcast. I've been working on my new Photos title for LinkedIn Learning and lynda.com, and I've enjoyed discovering all the new goodies for photographers. I thought that you might to know my 5 favorites of the bunch. Gallery View in the Finder with EXIF Data - Gallery View is the source of so many good things in the Finder. First, it's a great way to browse your images. Second, you can now view the full EXIF data in the view. And third, there are plenty of tools here via Quick Actions. More on that in just a minute. Built-In Video Screen Capture - This is really fun. Use the new command: Shift-Command-5 to display a robust screen capture tool for both stills and video. There are plenty of options including screen capture area, save to location, delay timer, audio recording, and show mouse clicks. Trimming Video with Quick Actions - There are four Quick Actions included with Mojave that allow you to perform editing functions right in the Finder: Rotate, Markup, Create PDF, and Trim. I like them all, but having Trim available to clean up my screen capture movies is super handy. 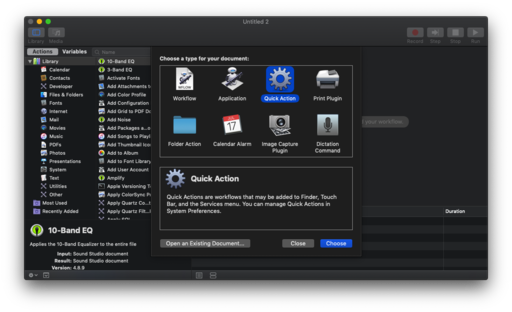 And if you're handy with Automator, you can easily create your own Quick Actions. I've already created a few for myself. Instant Scanner - We've been able to take pictures of documents with our iPhones for some time, and there are some nifty iOS apps to make that even better. But with Continuity Camera in Mojave, all I have to do is right-click in the Finder, choose Import from iPhone in the popup, and click on Scan Documents. I can create multipage PDFs right on the spot. Perfect for receipts and documents, especially when traveling on the road. Show File Names in Photos - Here's a feature that just happens automatically, and that photographers have been asking for since Photos came out. Now, if a picture does not have a title that you entered in the Info box, Photos will display its file name in the thumbnail view. Yay! What small biz owner wants to spend their time on paperwork, endless emails, and dealing with payment collection? That's why there's HoneyBook. I was very curious about this service, so I set up an account so I could explore in greater depth. The number one appeal for me was the ease of bookkeeping. I'm sure I'm not the only business owner who struggles with that. And Honeybook can definitely help me be more efficient there. But there are other features as well, such as managing your tasks, calendar, projects, and more. And I began to realize that this is an integrated system to ease the pain of managing all aspects of my business. The way they explained it to me was this: "Honeybook is a purpose-built business management platform for creative small businesses. They help photographers, designers, event professionals, and other solopreneurs save hundreds, if not thousands of hours a year by adding time-saving automation into their business. Honeybook makes it easy to streamline the client process, so you never miss a thing!" And that's why, for a limited time, TDS listeners can get 50 percent off the first year of Honeybook with promo code THEDIGITALSTORY. Honeybook membership includes unlimited access to ALL features, at one low monthly price. So go to HoneyBook.com today, and use promo code THEDIGITALSTORY to get started. Again, that's HoneyBook.com, promo code THEDIGITALSTORY. 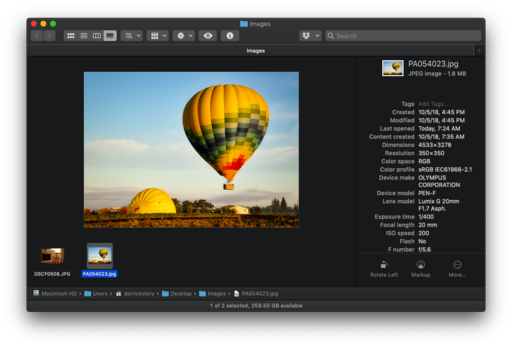 It's been a long wait for Luminar fans, but the much-discussed digital asset manager will finally see the light of day this coming December. This is also good news for those who signed up earlier this year for my Nimble Classroom on this very subject. As soon as I get an actual release day, I will schedule that online class. Skylum has released teaser videos that provide glimpses of the upcoming Luminar Library. At this point, it's hard to say what features the software will actually have in its first release. My guess is that a lot of that will depend on how well the closed beta testing goes. The new Gallery View in macOS Mojave is a photographer's treasure chest. Not only can you browse images in a meaningful way, you can also review full metadata and tap a number of tools that once required opening an application. To make things even more efficient, Apple has included a handful of Quick Actions to speed up the workflow. Take a look in the lower right corner of Gallery View, and you will see Rotate Left, Markup, and More. 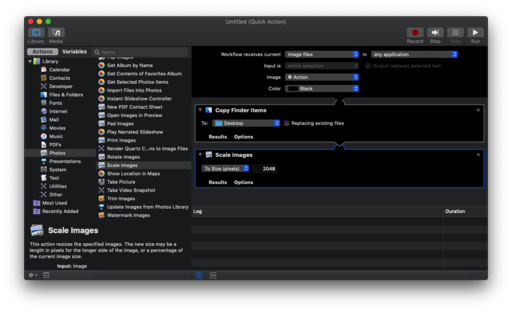 In the More menu you can also stash Automator scripts that are accessible via the Finder. These little scripts can really save your time for mundane tasks such as converting file types, resizing images, etc. And they are especially handy when you're working in Gallery View. In that spirit, I've added a few to the list that I needed. One of them, Scale to Social 2048, takes any image and resizes it to 2048 pixels on the long side... perfect for sharing on Facebook, Twitter, and other online destinations. Here's how I created it. First launch Automator. You can just use Spotlight Search (magnifying glass in the upper right of the interface) to find it. Then go to File > New and choose Quick Action from the popup menu. Now turn your attention to the Library column on the left and click on the Photos group. You'll see all sorts of tools in there. Drag over the one that want to the main window. Fill out any parameters that may be required. Decide what action(s) you want. The Quick Action is now available. From here, you can play on your own. I've created actions for converting PNGs to Jpegs, and for importing images into my Photos app straight from the Finder. It returns an error message, but it still works perfectly. Go figure. It's scripting. As I was driving south on Highway 101 to the studio this morning, I noticed an interesting scene to the west. 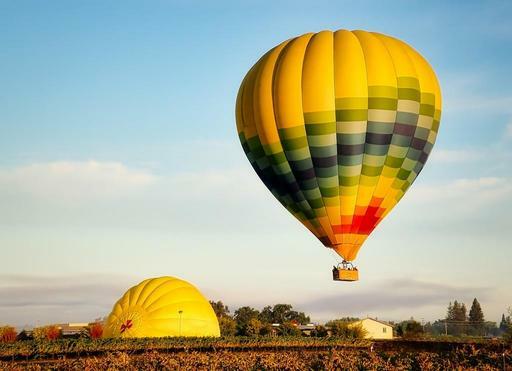 Two hot air balloons were down in a vineyard. One was up and looking ready to launch. The other wasn't faring as well. Fortunately, I could exit on River Road and drive over there for a closer look. What a beautiful scene. The warm colors of morning light combined with the balloons and vineyards. I could see the costal fog bank in the distance with a few additional wisps in the sky. I parked the car by the side of the road and tromped out into the vineyard, shooting along the way. I reached for the Olympus PEN-F, which had the Panasonic 20mm f/1.7 on it. There was no time to change lenses. One thing I know about hot air balloons is that if you look away for just a second, it's easy to miss the shot. Sure enough, as I was walking toward the scene, the first balloon began to lift off. I was shooting RAW+Jpeg, so I knew I could enable the doubler to frame the shot tighter. I love this feature on Olympus cameras. The 2X digital tele-converter is very high quality, especially when your Jpegs are set to Super Fine. I also recorded a few frames with my iPhone X for the geotags. Those shots are nice, but the don't have the same presence as the one captured with the PEN-F. Yes, smartphones are capable picture-takers. But I was really happy that I had a real camera with me this morning. 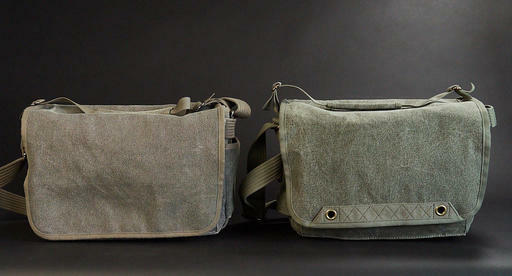 For years, the Retrospective line of photography shoulder bags has been one of the most respected and copied designs. And with the Retrospective 7 V2.0 ($165), Think Tank has improved this classic in a number of ways. 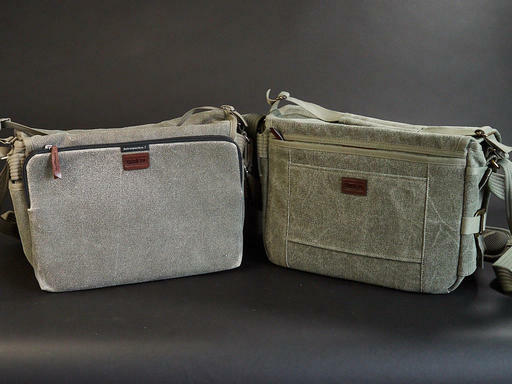 Highlights include a new zippered top security flap, interior laptop sleeve (up to 13"), outer trolly sleeve, improved side pocket, redesigned security hook and loop system, softer material, more attractive inner lining, and more. Let's step through those changes and see how they look. The outer shell of version 2 is softer with a smoother texture. A design feature on the bottom of the front flap improves the the appearance. Lots of big changes on the back side. Gone is the way too constrictive back pocket that could only hold a tablet or 11" MacBook. 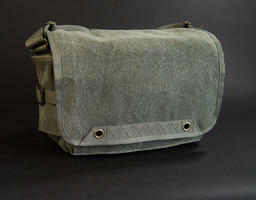 It was replaced by a zippered document pouch with a trolly sleeve that slides over the handle of your rolling luggage. The laptop compartment is now inside the bag. 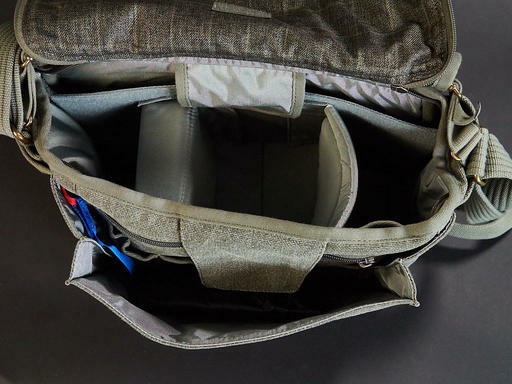 The two underpowered side pockets from version 1 were replaced with a roomy, expandable pocket on one side. When not in use, the storage area is held flat by a handsome buckle and two Velcro dots. When opened, it can hold a sizable water bottle or gear. The bottom of the pocket is lined with water resistant material to help manage condensation. The Velcro secure system has been improved. Now there are pockets behind the hook patch to hide the silencer flap when not in use. Also, the lining is softer with a handsome design... again, much nicer. A huge addition is the zippered security flap to keep gear safe when traveling from point A to point B. When working, you can attach it to the main flap to keep it out of the way. The design works well, and it provides extra peace of mind on the road. The laptop sleeve is now inside the bag, which is also more secure. 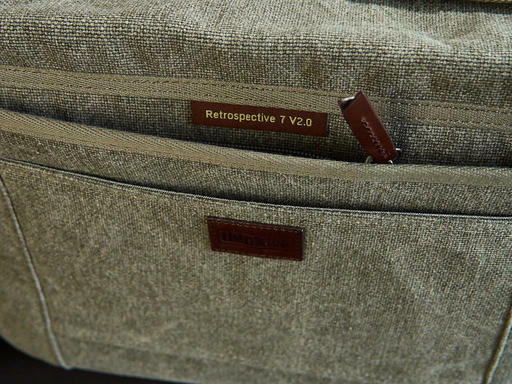 Plus, you can now stash a 13" model in the Retrospective 7 V2.0, making the bag far more practical for everyday use. 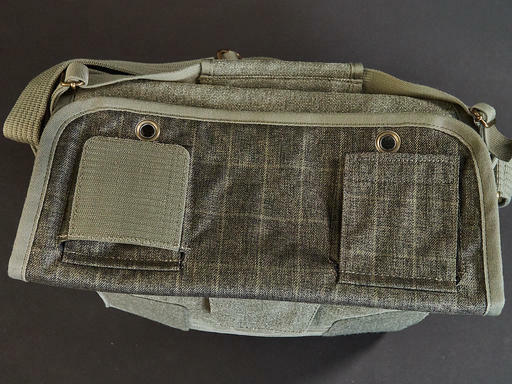 As with the original bag, there are plenty of stash pockets for accessories and personal items. The biggest challenge is not to overstuff these areas making the bag look puffy. The retrospective has a wonderful body-hugging design that looks great when not overpacked. For day-to-day activities, the bag preformed very well. I would have liked an in-between setting on the side pocket. The way that it's designed now, it's either all the way closed, or all the way open (which is quite large). I wanted it halfway at times for sunglasses and other small accessories. Stashing the laptop in the bag is definitely more secure. But it's not quite as convenient as outside access. This isn't really a complaint, rather an observation based on use. The Retrospective 7 V2.0 is an absolute pleasure to use. The Think Tank design team thought about every aspect of the bag, and they implemented thoughtful, and sometimes quite handsome, improvements. With virtually no complaints, I highly recommend it.